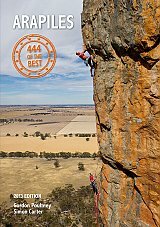 Authored by Gordon Poultney and photography from Simon Carter, this is a very affordable, small-format, selected routes guidebook to Australia's ever popular climbing area Mount Arapiles. A no-nonsense guidebook covering the best routes at all grades. Features cliff and action photography by Simon Carter. Cliff photo topos and user-friendly design make route finding a breeze. Small and compact - only 120x170mm; put it in your pocket, hang it off your harness. Over 80 photo topos! 132 pages, full colour. Perfect for short-term visitors, anyone interested in the classic routes, and anyone who wants just a small book to carry around.